nero profumo: Etat Libre D'Orange La Fin Du Monde: Powder To The People. Etat Libre D'Orange La Fin Du Monde: Powder To The People. They said this is an easy one. They said this is a more bombastic version of Dior Homme. They said this will almost pass unnoticed amongst the plethora of deliveries of this late 2013. 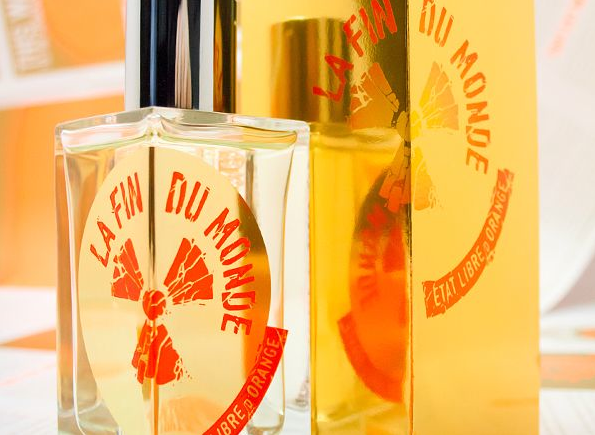 They said a lot of things but, actually, La Fin Du Monde is a very funny and incredibly solid fragrance. Yes, the link to Dior Homme is probably there but it's only relegated to the fact they both focus on iris as the core accord (which is honestly not enough to consider them similar). Just like with many other ELDOs, the fragrance is pervaded by an incredible sense of humor and subtle twists. Here, what really fascinates me, it's the almost holographic gunpowder accord which paired to the carrot-seed and the iris give birth to a funny accord entirely based on juxtapositions. It's like bombing a bouquet of flowers with a massive dose of TNT and some spices. enhances its pleasant oddness by emphasizing two polar opposites. Iris and gunpowder. On top of that, a smooth synth sandalwood / woody thing provides some extra body. Downline: The fragrance is based around the safest and most conventional iris / carrot seed accord but carefully and masterfully deranged by a lot of funny and dangerous things that will keep your attention up for quite a while. Probably not my favorite from the line but still extremely enjoyable and way more honest than most pretentious niche lines with their silly promises of faux luxury and exclusivity. If the french revolution were done with Uzis instead of pitchforks, this is what Paris would have smelled like!